A New War. A New Enemy. A New Battleground. One Man’s Impossible Mission. Former Royal Marine Commando Rocky Mason has had more than his fair share of pirate encounters. Ever since he was asked to retake a hijacked ship in 2005, he has travelled the world’s most dangerous waterways (South China Sea, Gulf of Aden and Straits of Benin), protecting ships from pirate attacks. Most of his time has been spent near the 2,000-mile coastline of Somalia, aka Pirate Alley, the most dangerous strip of ocean in the world. Each year 23,000 ships carrying over 50% of the world’s cargo sail these waters via the Suez Canal. Using fast skiffs and ladders, armed with AK’s and RPG’s, high on khat, pirates have taken everything from billionaires’ super yachts (ransom paid: $2m) to ships carrying Russian tanks (ransom paid: $3.2m). 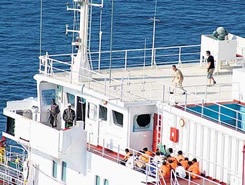 In 2008 Somali pirates raised $30 million in ransoms after hijacking ships and goods worth $40billion. Pirate Hunter details Rocky’s non-stop adventures and encounters with pirates. He has lost and retaken ships, been shot at with AK47s and rocket launchers - and in one instance jumped into the ocean to escape certain death. Bullets zipped through the water so close he could feel their wake. Rocky’s job is often made impossible because the law does not permit him to carry weapons on a commercial ship, so he has to find non-lethal ways to battle the pirates. 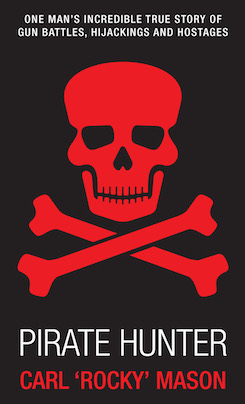 Rocky has over 500 royalty free photos of pirate attacks involving himself for inclusion in the book and which can be used for publicity purposes.